For those of you who really like low maintenance climbing roses, the Lady Banks deserves a good long look. 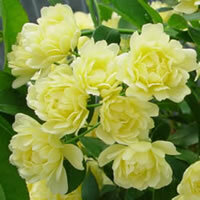 One of the first things you will discover about this pale yellow beauty is it is a thornless rose bush! The second thing you will learn is it is one vigorous grower so you will absolutely need to make sure that you give it a location that allows it plenty of room to grow. This is NOT a small garden rose bush my friends! I had my first experience with Lady Banks climbing roses a few years ago when I purchased one for my mother on Mother's Day. She has always had a thing for yellow roses, and she's not always able to do as much work in the garden as she would like, so I hoped a low maintenance rose bush would be just the right gift. It turns out I was just as impressed with the Lady Banks as she was. The Lady Banks I've found is one of the most tolerant varieties of roses that I've grown to date, and while I'm certainly not a master gardener, I've had the privilege of growing dozens of varieties. Like most roses you are going to want to choose a location that gets as much sun as possible. For the most part you can get away with partial shade in the afternoon when temperatures are at their worst, but the Lady Banks will do its best if you give it a good 6 to 8 hours a day of sunlight! Here's a tip for you; give it a location where it gets a full dose of morning sunlight, before it gets any shade! Lady Banks climbing roses love soil that is rich in organic matter, but then again few plants don't so this is not really specific to this particular rose. 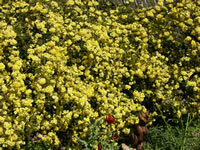 It is however a great rule of thumb for most roses and other types of plants. I always like to keep fresh compost nearby and when I plant a new addition to my landscaping, I add a little to the hole before planting. We are fortunate in our area that our local township has a compost facility nearby and they are usually happy to give up a little for free. Planting your Lady Banks roses is a snap and just about anyone can do it with some simple hand tools and a little motivation. If you received your plant as a bareroot plant from an online retailer then you will need to dig a hole that is wide enough to hold the roots of the plant you received. The idea here is to make the hole fit the plant, not to force the plant into a smaller hole. The hole should also be deep enough to allow you to mound up some soil in the center, and keep the bud union about an inch or two below the surface of the soil once the hole is filled. Set your Lady Banks climbing roses into the hole and back fill it about halfway to start. Then take a hose and water the soil you just put into the hole until it is almost the consistency of mud. You can then fill the hole the rest of the way and water it once again so that everything settles. The reason we do this is to ensure proper coverage of the roots and to eliminate any air pockets that might form. Make sure you pay attention to the depth of the bud union as it will settle a little once you water the loose soil. One of the things I found most impressive with this rose, as did my mother, was how easy it is to care for! While you can certainly give it a dose of rose food, following a normal schedule, it's really not required with the Lady Banks. If you give it enough sunlight and water this rose is simply amazing! It is hardy up to zone 7 and if your winters get a little severe at times, just give it a generous layer of mulch before the frost comes and you'll be ok.
As I said earlier, this thing grows like crazy and after a few years don't be surprised to see your Lady Banks growing upwards of 30 feet tall. You will need to plan accordingly for this rose, otherwise you will find it quickly overtakes anything in its way. My mother planted hers along the sunny side of her deck where it could grow wild, and this thing covered everything in its path. She actually decided to let it grow and moved other plants out of the way because of how stunning this rose is. 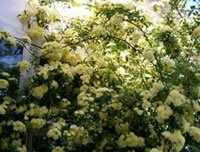 If I had anything bad to say about Lady Banks climbing roses is that it only blooms once every year with white or pale yellow blooms. I wish this variety would just keep going, but sadly it does not. Not to worry however, the show this rose puts on is well worth the wait. If you decide to go with this rose in your landscaping ideas, I assure you, you won't be disappointed. Pruning your Lady Banks roses should be done in the early spring before the leaves start to develop. This makes it much easier to see what you are doing and the plant isn't wasting its energy growing canes and leaves that will eventually get cut off. Start off by removing all the dead and diseased canes and gather up any leaves and debris around the base of the plant. Dispose of everything! Never let cuttings and old leaves lay around the base of your roses. Next, start cutting off the lateral canes that overlap and this is also a good time to train your main cane to go where you want them to go. Either tie them to the supports or prune them back to a bud facing the direction you want them to grow. With a little practice you will discover pruning roses is simple and easy and can be done in just a few minutes.